This unusual Gruen dates to the mid-1930s and features a sterling silver Wadsworth case. 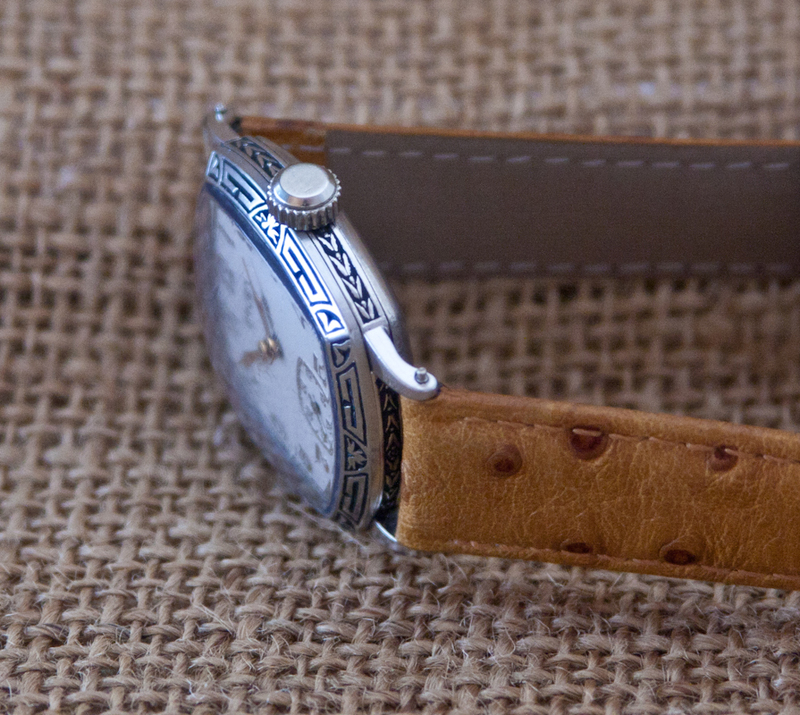 The watch is powered by a 15 jewel Gruen Guild movement and has been recently serviced. This unusual Gruen dates to approximately 1925 and features a sterling silver Wadsworth case. The watch is powered by a 15 jewel Gruen Guild movement and has been recently serviced. The case is in exceptional shape with no brassing or wear through. 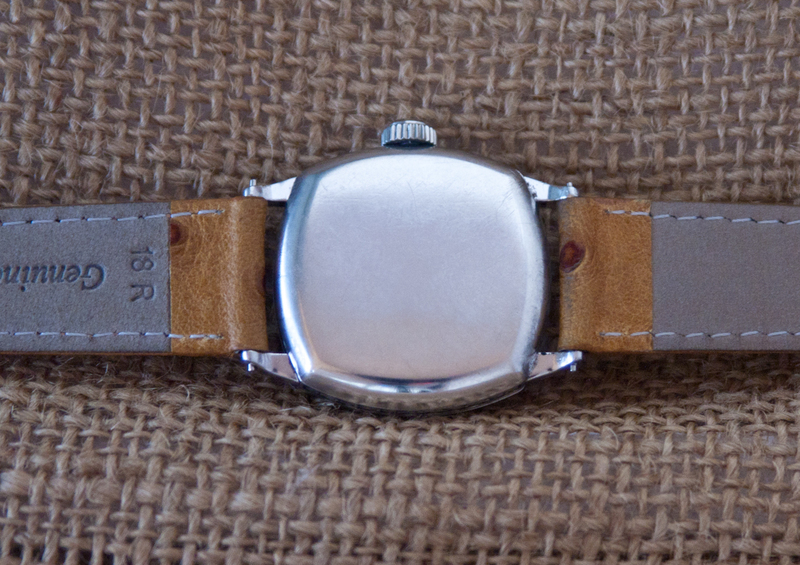 We’ve re-enameled the bezel and sides and the designs remain sharp and crisp; the watch was apparently worn very little. This is a Wadsworth case, not a Gruen signed case and the back is marked “Sterling Silver.” This is a three piece case, with the movement mounting in the middle piece. The dial has raised embossed gold toned letters on a white background. The dial and hands are all original, with the dial showing a patina suitable for its age. The crystal is a plastic replacement crystal and does show some distortion. 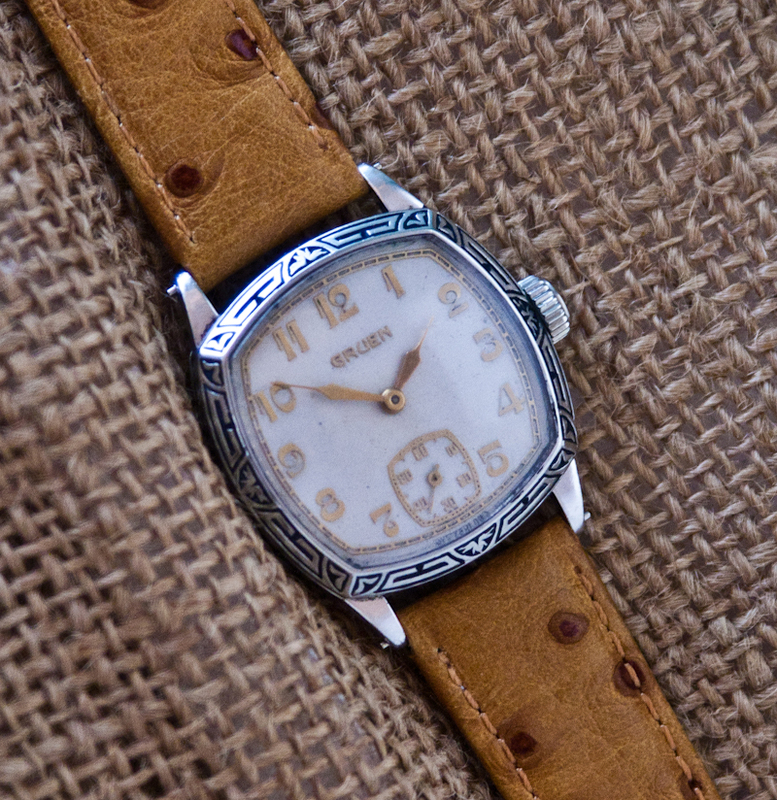 We can’t find this exact model in the Gruen catalogs (though there are very similar unengraved models), so this may well be a “jobber” watch, that is, a watch assembled by a jeweler for their customers — a common practice in the 1930s and 1940s. (However, given the lack of records from the period, it is possible that this was actually issued by Gruen.) The Gruen Guild 707 movement was produced in the 1920s and the 1930s, so our dating of this piece (c.1925) is based on the age of the movement. 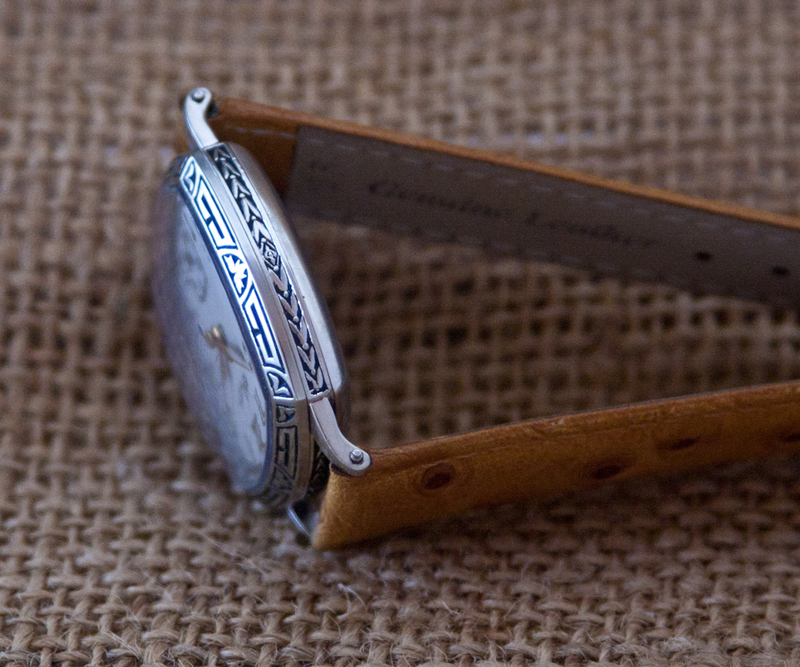 We’ve added to this watch a really nice new ostrich watch band and the watch is ready to wear. The watch was fully serviced in May of 2013.